Cam Newton of the Carolina Panthers. 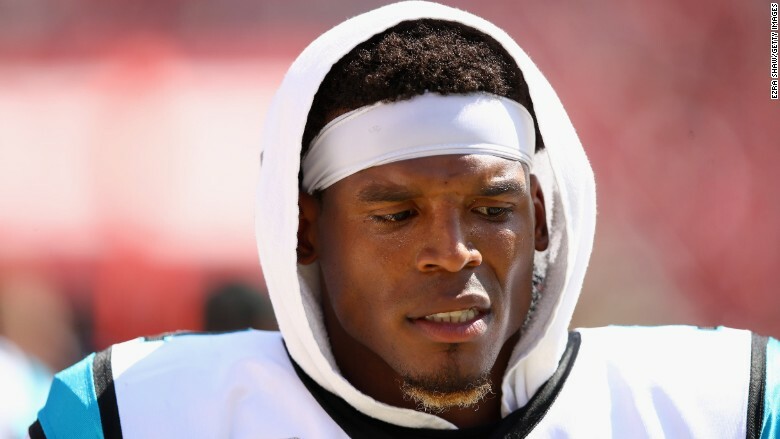 Oikos yogurt is distancing itself from Cam Newton after his sexist remark to a woman sportswriter. The brand said Thursday that it was "shocked and disheartened" by the Carolina Panthers quarterback's behavior and would no longer run advertisements with him. Newton has been pitching for Oikos since 2015. "It is entirely inconsistent with our commitment to fostering equality and inclusion in every workplace," Oikos, part of the Dannon company, said in a statement. Newton's marketing agent did not immediately respond to a request for comment. On Wednesday, Jourdan Rodrigue, a reporter for The Charlotte Observer, asked Newton about passing routes at a press conference. Before answering, he paused and said, "It's funny to hear a female talk about routes." He laughed and smiled before repeating that it was "funny." Newton also has endorsement deals with Under Armour (UA), Gatorade and Beats by Dre headphones, among others. Gatorade, which has frequently featured Newton in its commercials, on Thursday called his comments "objectionable and disrespectful to all women." Gatorade did not elaborate in its statement about any future relationship with Newton. The other brands did not respond to requests for comment.